Donate to support our independent reviews! 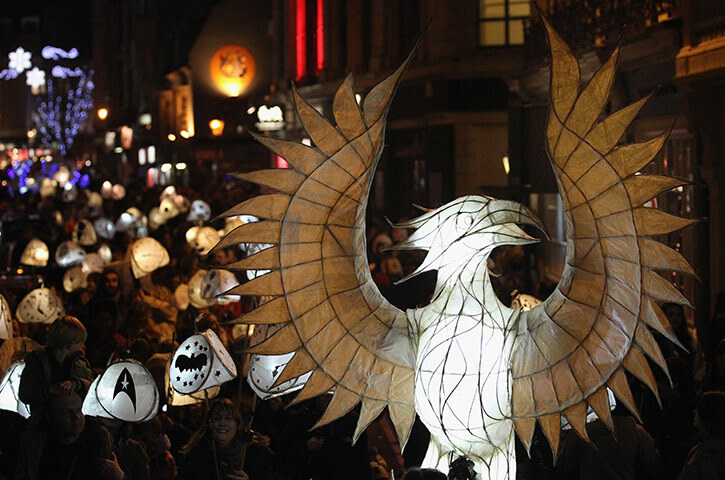 Taking place on the winter solstice, this fantastical procession brings magic to the streets, with a stream of luminous lanterns and a spectacular 2,000-strong parade. When the winter carnival has wound its way to the beach, people pass their handmade paper and willow lanterns – filled symbolically with their hopes and dreams – into a blazing bonfire and prepare for the spectacular fire show and firework display. Held on the shortest day (longest night) of the year, this growing tradition marks the passing of time by ‘burning the clocks’ and welcoming in the new sun. With over 20,000 spectators, this popular event turns the spotlight away from the more commercial side of Christmas and lights up the darkest of winter nights. Burning the Clocks is a free spectator event. The parade leaves from New Road at 6.30pm and arrives at Madeira Drive at approximately 7.15pm, when lanterns are passed onto the bonfire and the fireshow begins. The event finishes at around 8pm. The parade makes its way through North Street, Ship Street, East Street, onto the seafront and along to Madeira Drive for the finale. Please do not wait in New Road to watch the parade as this is our assembly zone for 2,000 participants and there is no space for audience. The fireshow will take place on the beach with viewing from Madeira Drive and the Upper Terrace on Marine Parade. The finale will contain loud music and pyrotechnics. Please note that the middle Terrace is unavailable as a viewing area this year. If you would like to take part in the parade, please purchase a lantern kit which includes parade wristbands. Participants are asked to arrive promptly at the Corn Exchange at 5pm to have their lanterns lit and be lined up safely. There will be a designated viewing area for spectators who require disabled access. Please note this will be allocated on a first come first served basis. On arrival at Madeira Drive, ask a steward to direct you or follow the parade to the finale site gates. We politely ask you not to bring home-made lanterns to the event as they compromise safety. We are required to safety check every lantern. We also ask people not to bring Chinese sky lanterns or fireworks to the event. Same Sky’s policy is that the event will go ahead, regardless of the weather, as long as it’s safe. However, we reserve the right to cancel the event on safety grounds in the case of extreme weather conditions. For more info including map please click the link below. via Coming to the Event | Same Sky. This entry was posted on December 8, 2013 by braveadmin in Brighton, December 2013, Uncategorized.